Do you know the percentage of 510(k)s that are rejected by the FDA the first time? Shockingly, it’s 75%. The vast majority are rejected for poor substantial equivalence, which, as you know, defeats the purpose of the submission in the first place. Today we’re going to talk to Mike Drues, president of Vascular Sciences and regulatory guru, about some common mistakes that can sink your 510(k) submission. ● Jon’s motivation for writing an article about common mistakes that sink a 510(k) clearance. ● The importance of consistency with documentation and using the checklist off of the Refuse to Accept Policy. ● Why the Refuse to Accept guidance contains some minutiae. ● Recommendations on providing the required testing and following the best practices. ● Suggestions on how to handle showing a long shelf life. ● Thoughts on why the FDA is reluctant to accept promissory notes when a submission is not complete. ● Thoughts on risk management and why it’s an important part of a submission. ● The most important takeaways regarding the 510(k) rejection problem. Jon Speer: Alright, I've got a pop quiz for you. Do you know the percentage of 510(k)s that are rejected by FDA first time? 75%. It's crazy, right? Did you know what percentage of those are rejected for substantial equivalence and not demonstrating that? I know, it's crazy. You're not gonna believe this number. It's 85%. 85% of 510(k)s that are rejected are done so because of poor substantial equivalence. That's just staggering, because the number one purpose of a 510(k) submission is to demonstrate substantial equivalence. So I hope you enjoyed today's podcast. I'm with Mike Drues of Vascular Sciences and we talk about some common mistakes that can sink FDA 510(k) clearance. 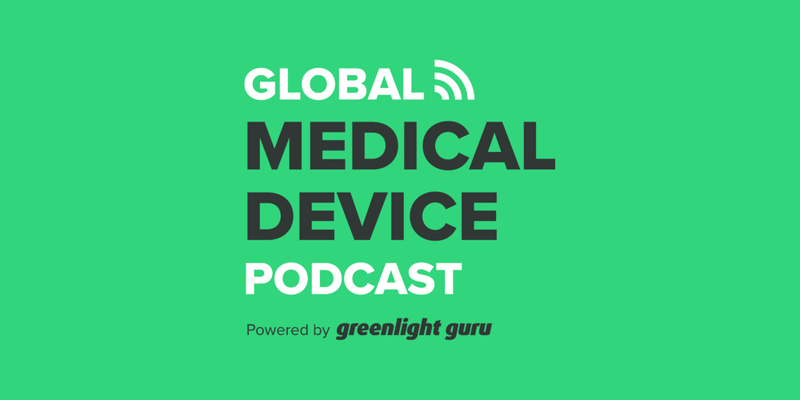 Jon Speer: Hello and welcome to the Global Medical Device Podcast. This is the host and founder and VP of Quality and Regulatory at greenlight.guru, Jon Speer. And today, I've got my good friend Mike Drues from Vascular Sciences joining me as well. Good morning, Mike. Mike Drues: Good morning, Jon. Jon Speer: Well, I know there's lots of things happening in our world these days and man, there's so many things that we could jump into from a topic standpoint. I thought I'd flip it around a little bit and I know you've got some good ideas and thoughts and things that you come across from time to time. Any thoughts or ideas on what we wanna jump into today? Mike Drues: Well, Jon, thanks for the opportunity to steer the discussion. Coincidentally, there was a very interesting column that just came across my desk the other day called "7 Common Mistakes That Sink a 510(k) Clearance" and lo and behold, you're the author. So I thought that what a wonderful topic for you and I to talk about a little bit, and we can certainly provide a reference link to that column with our podcast. But before we start getting into the recommendations and sharing our experiences with each other Jon, what was your motivation for writing this particular column? Jon Speer: Well, thank you Mike, and I'm glad you had a chance to see the article. Motivation, well, I know 510(k)s is an area that seems to be... Seems a lot of companies struggle with that, and more so than it seems like they should at times. And I know you and I have talked about this topic a time or two in the past, both on the podcast and just in our normal conversations, and there are some staggering statistics that are out there about number of 510(k)s that get rejected the first time and it just blows my mind, and it's like, "Well, maybe giving a few tips and pointers about some of the challenges or some of the pitfalls that, they're totally in your control, that maybe they'd be helpful." That was where the motivation, 'cause 510(k) path, to my knowledge, still remains to be the most common path for getting medical devices cleared through the FDA. Couple that with all the struggles that companies seems to be having, it just seems like it would be a good time to share some tips. Jon Speer: Now that's just crazy. Mike, that's crazy. Mike Drues: The workhorse of the industry, no doubt. It is crazy. It is crazy, absolutely. So it's amazing to me how many people think the 510(k) is such an easy thing, substantial equivalence is such an easy thing, but if it was such an easy, simple, straightforward thing, how do we explain those statistics? And I know we're focusing on the 510(k) today, but for those in the audience that are working in the Class III, the PMA side of the universe, it's actually even worse. 89% of PMAs that are submitted to the FDA today are rejected first time, out of the box, and they result with what's called a major deficiency letter. And many of the tips and tricks, so to speak, that you and I will be sharing today are similarly applicable in the PMA world as well. So the first couple of mistakes that you mentioned, Jon, I'll just kind of lump the first two together: Inconsistency with documentation and not using the checklist. What can you tell your audience about those two things? Jon Speer: Sure. Well, for me, when the... A few years ago, FDA came out with this Refuse To Accept policy and they wrote a guidance document about that too. And with that guidance document, they included this checklist, this Refuse To Accept checklist. And the checklist is largely intended to be a tool used by an FDA reviewer when they receive submissions, they're gonna be going through that checklist to identify that, really, all the constituent components or parts and pieces of a 510(k) are there, that it's complete. And it surprises me how few people seem to be aware of that Refuse To Accept policy from the industry side of things, from companies that are submitting those 510(k)s. And the FDA is a beautiful thing at times, because they tell you what the rules are, they tell you how they're going to evaluate those rules, so to speak, and I think this is a good case where... Use the guidance document that FDA reviewers are using. Jon Speer: Use that checklist to your benefit, because if you go through that checklist and you can identify, "Hey, here's where we answer or address this particular piece. It's on this page." And that sort of thing. You fill that checklist out and then you provide that as supplemental information to your 510(k) submission, then you're doing your reviewer a favor. Frankly, you're doing yourself a favor. Frankly, you're also confirming that all the things that an FDA reviewer would expect with your 510(k) submission have been addressed appropriately as well. And I think people, a lot of companies get that you're kind of building this 510(k), it's not like it's a moment in time, so to speak, as I'm like, "Okay Mike, it's Friday, we're gonna compile our 510(k)." I suppose some companies probably do that. But the idea is that you're kind of building this thing as you go, and oftentimes, a 510(k) construction, you may farm different parts and pieces of a submission out to different resources. Jon Speer: But it really is important to make sure that all these different sections, they coalesce, that they are in sync with one another. And I think sometimes that just that basic check, that basic step, to make sure that the content in this section aligns with the content in this section, and that we've done all the things that we were supposed to do that FDA is expecting that we do as part of that, that's really what those two pitfalls are all about. Mike Drues: Well, I'll share a quick story with you and your audience on that. When the RTA guidance came out about two years ago, it was one of the most popular, and at the same time, one of the most controversial guidances that came out of CDRH that year, I believe, 2015, and I did a column on that topic myself. But I remember I was at a conference and one of my friends from FDA was presenting that particular guidance and going through some of the details of the checklist. And by the way, in that guidance, there are three checklists for each of the three different 510(k)s, the traditional, the special and the abbreviated. And ironically enough, the abbreviated 510(k) checklist is, in fact, longer than the traditional 510(k) checklist. The abbreviated 510(k) checklist is actually 26 pages long. So, "abbreviated" doesn't necessarily mean what a lot of people think it means. Mike Drues: Anyway, at this particular conference, somebody at FDA was presenting, and I happened to know this person quite well and I wanted to ask her a question because I wanted to generate some discussion on this. And I said, "With all due respect, do we really need anybody, let alone our US government or the FDA to tell us to put our names on our papers? Because a lot of the things on those checklists are, make sure you have your name, your page numbers, a lot of minutia like that." And she said that she agrees with me 100%. She and I go back a long time. But it's amazing to her how many people don't do that. And as a consultant for the FDA myself, I have the privilege of seeing submissions that come into the agency, and some of them are terrific. Some of them are wonderful. Well-written, well-thought out, well-presented. But let me tell you, Jon, let me be brutally honest. Some of them are just total crap, 100% crap. So simply put, the more difficult it is for the reviewers to figure out what it is that you're trying to say, the more difficult the review process is going to be. Jon Speer: Yeah, I was just gonna say, I remember when that guidance document came out too. And I remember my knee-jerk reaction to that was, "Oh my goodness. Are you kidding me? This is crazy." But then you understand what it's all about and review the details and go through that checklist. You're like, "Oh wow, this is really helpful." So if you're listening, audience, and you maybe have this eye roll, or the moment where you're kinda like in disbelief or frustrated about Refuse To Accept, my opinion is, it's been a very, very good guidance document. It's been a very good change in, from my perspective, FDA policy, when it comes to reviewing 510(k)s. Because it used to be one of those times where you'd kinda throw it over the wall, and you'd prepare your submission, your 510(k) submission, and you'd kinda throw it over the wall to FDA. And it's kind of like you go into a darkness, a period of radio silence, so to speak. And at least with the RTA, the Refuse To Accept policy now in place, you have a lot more, at least in my experience, a lot more interaction with FDA reviewers, and for me, that's been a really, really good thing, really promising thing. Mike Drues: And you know me Jon. I said, "Okay look, I understand we have all our rules and policies and we have to follow procedures and so on. But let's not lose track of the big picture." No patient's lives were taken because a three-page document did not have a table of contents. Alternatively, no patient's lives were saved because a three-page document did not have a table of contents. So what I like to apply is what my lawyer friends call the common sense test. But anyway, the RTA guidance is a good checklist. I think we both agree that people should definitely use it. Let's move on to your next couple of tips. You talk about not providing all of the expected testing, including things like shelf life studies. What can you all our audience in terms of recommendations for those kinds of things? Mike Drues: No. It's what we called promissory notes. You're exactly right, promissory notes. Jon Speer: Yeah, go ahead. Mike Drues: I was just gonna interject for the audience that's not familiar with that, Jon, and then I'll let you continue in a second. Basically, what Jon is describing is, we would make a submission to the FDA, with perhaps 90 or 95% of the information present. But one or two pieces that might take longer, like for example, shelf life or something, we would say to the agency, "This is still in the process of being collected and we'll send it to you as soon as it's done. In the meantime you can review everything else." That's basically the idea. Jon Speer: Yeah, yeah. And I don't think there was an official memo or policy shift per se, nothing that was formal at least. But today, those promissory statements are generally not accepted from the agency and I think this is something that industry is not up to speed about. There is an expectation that you actually provide the results of those activities as part of your 510(k) submission. To say it another way, there's an expectation that your 510(k) be complete with your results of the expected performance testing, including things like electrical safety and sterilization validation and shelf life. Now, shelf life can be an interesting one. If you have a single-use disposable product, it's common that you would want to have a three year shelf life, for example, from date of sterilization on your product. Jon Speer: Well, you'll need to corroborate any shelf life claim with supporting evidence, and that supporting evidence should include some shelf life studies of some sort. The common accepted practice, largely, has been, "Let's do some accelerated aging." And yeah, that's still an acceptable means. It's been my experience, and Mike, I'd be be interested to hear your take on this. It's been my experience that the shelf accelerated aging is fine, but there seems to be a shift, or a growing expectation, that you're able to basically corroborate that your conditions for accelerated aging are commensurate with what you would expect for real-time aging. Jon Speer: And so I guess there's kind of a chicken and an egg scenario here. Like, for example, if you want to have a three-year expiration date or shelf life for your product, and you need to be able to show that real-time and accelerated, that those are in sync with one another, what do you do? So the practice that I've seen a lot of companies do is, they'll initially launch or introduce or suggest a lesser shelf life. They may roll out with a one-year shelf life, or something along those lines. Support that claim with the accelerated aging. And then, oftentimes, there is some real-time aging for those certain time points to be able to support that. But Mike, I guess I'm a little interested to hear what your experience has been on that particular topic. Mike Drues: Well, in terms of shelf life testing, whether it's accelerated or real-time, to me it's a very basic validation question. There's nothing unique whatsoever in terms of shelf life. What you have to do, simply put, is show that the method that you're using to accelerate your shelf life testing, whether it's commonly an increase in temperature or something like that, matches the similar results in real-time. So in other words, you need to compare one of your products that was aged for, say, a month real-time, compared to the equivalent of that in the accelerated fashion, and two months, and three months, and six months and so on. So basically, simply put, you have to validate the test. Mike Drues: If you are using a shelf life method that's established, and that's been used before, that becomes less of a concern. But where this really becomes an issue, and this can be a topic of a different discussion, Jon, is when you're getting into very, very interesting new medical devices, made out of funky bio-materials, especially bio-absorbable materials, or combination products that now start to include, not just the device, but perhaps a drug or biologic or something else. That's where shelf life testing, as well as sterility and stability and everything else, starts to get very, very interesting. And perhaps in the future, Jon, if we wanna have a more technology-oriented discussion, I would be happy to do that. Mike Drues: Because I do work a lot in that area. But what I'd like to do is, I'd like to come back to what your original comments are on the promissory note, because that's something a little more applicable to our industry across the board. Just to give you and your audience a little historical perspective. In the past, you're exactly right, Jon, FDA has been willing to take these promissory notes. As I said, basically, the company says, "Well, we don't have this right now, but here's 95% of the submission and we'll give you this last few percent as soon as it's ready." In the past, the FDA has been willing to take that. Unfortunately, and I hate to say this, Jon, but there's a lot of truth to it, some companies in our industry have reneged, have not met their obligations. And to be fair, not just device companies, but drug companies have done this too. And as a result, FDA has gotten burned. And so today, they're much more reluctant. They're much more hesitant to take a promissory note. You can still do it. I still am able, in some cases, to get them to take a promissory note. But it's become a more difficult pill to get them to swallow. Mike Drues: Unfortunately, that's often the case when it comes to regulation. Just to finish up this discussion of this particular point, when it comes to... One of the recommendations, which I strongly agree with, that you make in your column is, not providing all the expected testing. Well, to me, that's a very amateur mistake. One of the common reasons why 510(k)s are rejected is because the company does a dozen tests and FDA comes back and says, "Well, what about these other two tests, we would... We want to see these other tests." Well, that's such a rookie, that's such an amateur mistake that should never happen, that can easily be avoided by... And this is something that you and I have talked about in the past, Jon, communication in advance with the agency in the form of a pre-submission meeting or something else. Mike Drues: And this is something that I do routinely. I present to the FDA, "Here is our complete testing matrix." As your audience may know, FDA will not review data during the pre-submission meeting, that happens at the point of the submission. But what they will review, and what they should review, is your testing matrix, "Here is a list of all of the tests that we're going to do. And assuming the data what we say it's going to show, these are all of the tests that are necessary in order to establish the safety and efficacy and to support the labeling for our device." So it's unfortunate that this happens so often, because it is a rookie mistake. Jon Speer: It is, yeah. It is. Mike Drues: The last two recommendations in your column, Jon, that you mentioned, and I agree with 100%, are both great, big topics, both topics that we've talked about in the past before. One, in terms of risk, and the second in terms of substantial equivalence. Now again, we've talked, I think, about both of those topics in the past, but, at a high level, what do you think people should know, in terms of risk is, what is substantial equivalence? Jon Speer: Yeah, I think... Well, I think in... Just in regulatory submissions and expected industry best practices in general, we're in an era where risk management is kinda front-and-center, not only when it comes to products, but also, now, with 13485:2016, they've implemented this concept of risk-based quality management system. And it makes good sense; you've got standard ISO 14971 that's been widely accepted, it's been harmonized for a long time now. And the premise, or the idea of the concept behind risk, is to demonstrate that your product is safe, frankly, and that you've identified the specific hazardous situations and harms, and estimated the likelihood and the severity of those particular items, and that you've taken the necessary mitigations, and that you've implemented the appropriate controls to ensure that the product that you're manufacturing and delivering to patients is going to perform as you expect, and it's not gonna create any sort of unnecessary or unexpected risk. So from an FDA perspective, you need to demonstrate that. Mike Drues: Well, that's certainly terrific advice, Jon. Jon Speer: 85%, because they didn't demonstrate substantial equivalence. Come one, this is the whole idea behind a 510(k). So obviously that's a pretty important piece that one needs to address as part of your submission. Mike Drues: So Jon, as always, I think that's all terrific advice. I would just add a couple of things on the risk side. Again, these are both topics that you and I have discussed in the past and maybe, because there is so much misunderstanding, we should do it again, but on the risk side, I would say two things: First is that I often see companies take their risk management plan that they put together as required, and the design controls, and literally copy and paste that into their regulatory submission as their risk mitigation strategy. And I often say, I don't even have to read it, and I know right away that it's wrong or, at the very least, that it's incomplete, because the risk management plan that we do for the design controls is just one small sliver, one segment of the complete risk mitigation strategy that goes into the 510(k) submission. That's point number one. Mike Drues: The second point on risk that I would like to make is just to remind the audience what exactly the regulatory requirements are for risk in the 510(k). They're basically two of them. One is that your new device cannot introduce any new risks that are not already known or present in the existing or the predicate device. And the second is that, in terms of the level of risk, the level of risk management higher for any of these known risks in your new device as it is in the predicate. It can be the same or lower, but it cannot be higher. Now, strictly speaking, that's what the regulation says, but we don't live in a black and white world, and I do not take a literal interpretation to the regulation, as so many people do. I try to understand the intent of the regulation and then to apply it. Mike Drues: Many times, I've been involved in a 510(k), for example, where there are, let's just pick a number, 10 risks that we've identified. Nine of them are the same as the predicate device, but one of them is not, one of them is new. Does that necessarily kick us out of the 510(k) universe into, perhaps, a de novo? The short answer is, "Absolutely not, at least, not necessarily." If I can go into the agency and argue, yes, there is one new additional risk that's not present in the predicate, but I can dismiss that by saying, comparatively speaking, it's really not that big of a deal, especially if a failure mode associated with that risk is a trivial one, then I can keep it in the 510(k). If I can't, then maybe that's the opportunity to kick it over to the De Novo. So those are the two points that I wanted to remind the audience in terms of risk, that your risk management plan is not the same as your risk mitigation strategy and, obviously, know what the regulatory requirements are. You can't create any new risk, and the level of risk has to be the same or lower than what they are in the predicate, at least in theory. Mike Drues: And finally, when it comes to substantial equivalence, yeah, you're right. 85% of 510(k)s that are rejected are rejected specifically because of substantial equivalence. I find this, to be honest, laughable. I think this is such an amateur mistake, this should never happen. No company should ever, ever, ever have a 510(k) rejected because of substantial equivalence or the lack thereof. Mike Drues: It is such an easy mistake to avoid. Again, it comes back to what I mentioned earlier, what you and I had talked about before, communication with the agency, is the pre-sub or something else, but one of the things that you bring to the agency in advance of your submission. Here's our new medical device, this is what it does, this is the way that it works, this is what we're gonna say about it in terms of the labeling, this is our regulatory pathway, 510(k), Class II or Class I and here's why, here's what we're gonna be using for our predicate, and here's why... Oh, by the way, I also like to include what I'm not using as a predicate, and why I'm not using it, and hopefully everybody will buy in and agree that we're all pulling in the same direction. It's just amazing to me how many companies, they have these things happen and it's just frustrating after 25 years of playing those games. Mike Drues: This is why I appreciate the opportunity for you and I to share some of our thoughts and some of our best practices with the audience. I don't wanna put words in your mouth, Jon, but it's one of the ways that I try to make the world a better place. Jon Speer: Yeah, no, and Mike, I'm glad we had this conversation, and I appreciate you mentioning this particular content piece. So folks, as Mike mentioned at the beginning, I'll share a link to this article. It's called "7 Common Mistakes That Sink FDA 510(k) Clearance," and you can find it on Med Device Online. And I know that you can also read some really fantastic articles from Mike Drues as well on Med Device Online, so a lot of good content. Mike Drues: Well, that's very kind of you to say, Jon. Thank you so much. Why don't we wrap this up with just one more question. Mike Drues: So what would be, do you think, is the most important take-away, the most important soundbite, either that we've talked about today, or something else that you've mentioned in your column, regarding this 510(k) rejection problem and trying to get past it? What is the one piece of information that you really want the audience to walk away with and remember? Jon Speer: Well, I think the statistic that you shared doesn't lie, Mike. 85% of 510(k)s that are rejected are done so because of the substantial equivalence. Like you said, that's such a rookie mistake. So if you do one thing right in your 510(k), do realize that demonstrating substantial equivalence is the number one thing. Of course, all these other tips that we've shared are key as well, but you gotta demonstrate substantial equivalence. You just... You have to do that. What about you, Mike? Mike Drues: I think that's a good piece of advice, Jon, and the thing that I would leave with your audience... And oh, by the way, I'm a big fan of what Ronald Reagan used to say, and that is "trust but verify." So for those of you that want to verify those statistics, you can find them as part of the Medical Device User Fee Amendments, MDUFA. FDA is required to put out quarterly statistics, so every three months on FDA's website, there is a very extensive report, it's usually some 300-plus pages long. And if anybody wants, we can post the link or just send me an email. You can verify those statistics. They change, obviously, every quarter, plus or minus a few percents, but they've been fairly consistent for a number of years. Mike Drues: So the last piece that I would like to leave your audience, and this is a recurring theme with me, Jon, as you know, and as I'm sure many in the audience who regularly listen, is so many of the things that we've talked about today, so many of the things that Jon very nicely described in his column, "7 Common Mistakes That Sink a 510(k)," so many of these things can be greatly minimized, if not completely avoided, by communicating in advance with the agency. This is not supposed to be a... Don't treat the FDA as an enemy. That's a huge mistake. If the first time that FDA is seeing your device is during your actual submission, to me, that is a huge mistake. And unfortunately, that is still very much the practice in our industry today. Jon Speer: It is. It is. Well, Mike, great to have a conversation with you as always. 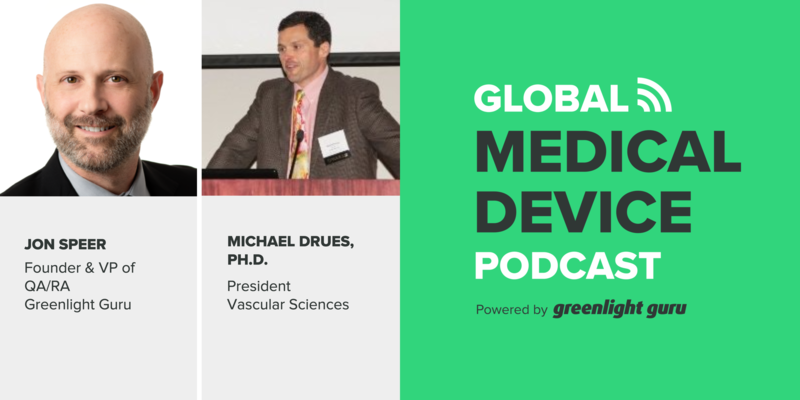 And folks, if this is your first time listening to the Global Medical Device Podcast, I encourage you to go through the archives and check out some of the previous conversations. Mike and I have had quite a few, there have been other guests as well. But do check that out. And I guess Mike is somebody you should know about if you're putting together a pre-submission, or a de novo, or a 510(k), or a PMA because, you know what, this is what Mike does for a living, and he hinted at it throughout today's conversation, but Mike works a lot with industry, but he also does consult for regulatory agencies, including FDA as well. So he's definitely an insider. He's a guy that's in the know, and really a great resource for you to tap into as you prepare this valuable information about the regulatory status of your products. So reach out to Mike Drues, Vascular Sciences. Jon Speer: And of course, if you are engaged in any sort of product development activities, documenting risk, you're building your quality system... If you have something, that's terrific. Even if you don't have something, there's a company here to help, and that company is greenlight.guru. So we focus on true quality aspects of product development, of risk management, of just quality management system in general. Compliance is a secondary... It's important, don't mishear me. You need to be in compliance, but you need to shift that mindset. I think for so long, the industry has been stuck in just thinking about compliance as the way that we need to address these things, but I think Mike has mentioned before, in previous conversations, just demonstrating compliance means you're a C student, means you're average. So maybe you should shift and focus a little bit more on true quality so that the products that we're designing, developing, manufacturing are as safe and effective and meet those indications for use, to the utmost possibility. Jon Speer: So if you wanna learn a little bit more about what we're doing at greenlight.guru, just go to our website and you can request more information. So wanna thank my guest, Mike Drues. And this has been Jon Speer, the host, founder and VP of Quality and Regulatory at greenlight.guru. And you have been listening to the Global Medical Device Podcast.